A prospect we've written about extensively over the last few years, Mouhammadou Jaiteh elected to keep his name in the 2015 NBA Draft coming off a strong year with EuroChallenge Champion Nanterre where he averaged 10.5 points and 6.2 rebounds per game in just 21 minutes of action. A staple of the French Junior National Teams since 2010, Mam emerged as a prospect averaging 16.2 points and 9.7 rebounds per game for Boulogne in the French Second Division (Pro B) during the 2012-2013 season. Subsequently popping up at the Nike Hoop Summit, adidas Eurocamp, and finally the NBA Combine, Jaiteh has made the rounds the last few years, performing very well at some stops but not at others. Averaging 11 points and 9.5 rebounds in the competitive portion of the Combine, Jaiteh made a nice impression in his last opportunity to showcase his abilities (in a five on five setting in the US) in front of a horde of NBA General Managers in Chicago last month. Standing 6'10.5 in shoes with a 7'4 wingspan and a 250-pound frame, Jaiteh has looked like a NBA player since he was 17. Not particularly explosive or fluid, Jaiteh remains an average athlete, but he's improved in a number of areas over the years, putting himself in position to hear his name called on draft night, possibly even in the late first round. Offensively, Jaiteh saw his role expand significantly relative to last season. Averaging only 5.7 points per game off the bench in 2014, Jaiteh started all 50 games for Nanterre this season, seeing his post touches nearly double, while he continued to be involved in the pick and roll, on the offensive glass, and as a target for dump passes inside. One of a number of players averaging in double-figures for the club based on the outskirts of Paris, Jaiteh was a key cog in a balanced offensive attack that finished in second place in the regular season but were upset by 7th seed Nancy in the playoff quarterfinals. Though he still lacks a degree of touch, Jaiteh does not look quite as mechanical as he appeared a few years ago when converting inside. Shooting on 50.9% inside the arc a year ago, Jaiteh improved to almost 60.2% this season as he struggled scoring one-on-one in the post at times, but finished very reliably at the rim. He does a better job scoring over and around defenders with both hands than he did in his youth, leaving some optimism that his touch may continue to improve over time. Proving fairly effective operating one-on-one on the low block in the 2nd division, Jaiteh hasn't been particularly efficient scoring with his back to the basket over the last two seasons, despite seemingly having improved his footwork and doing a better job establishing deep position inside consistently. His sheer size allows him to be effective at times, but he also throws up some bad misses as well. He's grown more patient on the block as he's matured, which was obvious at times this season. Attempting very few jump shots this season, questions remain about Jaiteh's ability to have an impact away from the rim offensively. His 58% free throw shooting remains a concern, and he clearly has a ways to go before he'll be able to function as a viable option outside the paint. Though Jaiteh isn't a great passer, he does an adequate job finding the open man, seeming to have a better understanding of the game offensively than he did a few years ago. A very solid rebounder, Jaiteh can make an impact on both ends when he's dialed in. Averaging 11.4 rebounds per 40 minutes pace adjusted, he ranks among the more productive rebounders in this draft class thanks in large part to his combination of size, length, and strength. Defensively, Jaiteh's lack of explosiveness hurts him. He struggles against quicker, more explosive players and doesn't provide much in the way of rim protection. Much like on the boards, his size can be an asset at times, but he has a lot of room to grow both as a post defender inside and when looking to help his teammates in the pick and roll and away from the rim. This is one of the bigger concerns NBA teams have about projecting a role for him at the next level. This season was a coming of age of sorts for Jaiteh. He didn't take a massive step forward, but he consistently applied his tools against senior level competition effectively. His size and length is impressive, and his ability to finish and rebound the ball are strong selling points. A lock to hear his name called in the top half of the second round, at the very latest, Jaiteh is a player worth keeping an eye in the coming years. He won't turn 21 until November, and the strides he made this season leave plenty of room for optimism. He would likely be projected slightly higher if he were willing to be flexible about staying (being stashed) in Europe for another year or two rather than insisting on coming over right away, so it will be interesting to see how things play out for him on draft night. The French big man was the most productive player on the floor for the winning team, having a very strong outing that seemed to resonate with the NBA executives in attendance. He crashed the offensive glass consistently with his outstanding combination of strength, length and soft hands, and also was able to score inside the paint repeatedly after establishing deep post position. Jaiteh's experience playing against men was evident today, as he was extremely aggressive, but also patient enough to know how to find the open man or draw fouls. The only downside was probably his defense, as he struggled somewhat against the equally aggressive Rakeem Christmas, who scored on him a number of times, and also had issues on the pick and roll, looking very straight up stepping out onto the perimeter. One of the more highly touted players here among international prospects, Mouhammadou Jaiteh had a nice day today pulling down 13 rebounds and scoring 10 points against the camp All-Star team. When he's dialed in, his sheer size allows him to be a factor around the rim as a finisher and rebounder, but his limited fluidity and explosiveness make it difficult for him to impact the game defensively. His post game appears to have improved some, as has his footwork and ability to make decisions and put the ball on the floor from the midrange. His shooting form remains on the rigid side even though he managed to sink a midrange jumper today, and his overall feel for making his presence felt consistently is still a work in progress. Though Jaiteh struggled at times at the Hoop Summit last year and looked less than focused for some stretches the past few days, overall, he showed improvement here. His lack of great athleticism will give scouts pause, but there's little doubt he'd have been drafted in the second round this year had he declared. Averaging 6.7 points and 4.3 rebounds per-game for Nanterre in the French League, Jaiteh's ability to gain high-level experience and continue to improve his skill level should help him improve his standing among scouts in the coming years, as he won't become automatically eligible for the draft until 2016 should he not enter the draft next year. Measuring in at 6'11 with a 7'4 wingspan and a 249-pound frame, Mahammadou Jaiteh aced the look test, catching the eyes of NBA scouts immediately at the Nike Hoop Summit. Despite widely being listed at 6'9, Jaiteh looks every bit like a NBA center on first glance with his chiseled frame, and turned in a solid showing in Portland, particularly in the practices leading up to the game. Perhaps the most significant thing Jaiteh did over the course of the week was play hard. Despite averaging a double-double for SO Maritime Boulogne in the 2nd division of France, Jaiteh has looked apathetic at times this season in league play, but clearly made it a point to demonstrate that he can play with greater intensity in front of the hoard of NBA scouts assembled in Portland. Making his presence felt over the course of the week with his combination of size, strength, and instincts, Jaiteh finished with 6 points and 9 rebounds on 3-8 shooting on game day. A massive interior presence, Jaiteh didn't show the most polished back to the basket repertoire over the course of the week, but was able to score with a simple hook shot inside. He showed the ability to step away from the rim and make shots from 15-feet from time to time with a consistent, albeit a very mechanical shooting motion. Jaiteh struggled most frequently on offensive when forced to finish in traffic. Looking a bit rigid, the 18 year old isn't a long strider running the floor and doesn't appear to have an easy time getting low to explode up for dunks unless he has a few steps to gather himself. Getting his shot blocked by more explosive big men relatively frequently, Jaiteh has an incredibly mature frame despite being one of the youngest players on the World Select roster, making it difficult to project if he can become less upright and more explosive at the rim after a few years in a NBA strength program. His lack of great explosiveness also limits his defensive presence to a degree, as he is not much of a presence inside the paint, certainly not as a weakside shot blocker, despite his size and length, and isn't quick enough to stay in front of quicker big men on the perimeter. Jaiteh displays solid timing contesting shots defending the ball, though, and his size certainly lends itself to holding position on the block one-on-one and rebounding his area, which is perhaps his biggest strength as a prospect. Jaiteh displays terrific instincts for pursuing loose balls and was able to show that all week long in Portland with the way he attacked the glass. The fact that he averages 10 rebounds per game in 28 minutes does not appear to be a fluke. 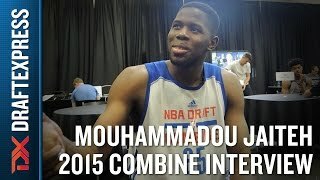 The second youngest player currently declared for the 2013 NBA Draft, Jaiteh is an interesting prospect considering his age, size, and strength. Having expressed the desire to come over to the NBA as quickly as possible, he's a long-term project a team with patience and resources could look to draft and cultivate in the NBADL or leave overseas. The French second division (Pro B) is a league typically dominated by undersized American veterans, which most top young local prospects (with the exception of Evan Fournier) decide to skip as they seek out the best route to develop their skills long-term. With a father hailing from Senegal and his mother a native of Gambia, Mouhammadou (Mam) Jaiteh was born in France. Despite picking up the game relatively late at age 13, his outstanding physical profile made him a fixture on the French junior national teams (U16 and U18) the past three years and earned him a coveted spot at INSEP (the National Institute for Sport and Physical Education), a government sponsored academy for top athletes in 24 (mostly Olympic) sports. Upon finishing his time at INSEP, the 17-year old Jaiteh elected to take the same route Evan Fournier did, quickly establishing himself as one of the most productive players in Pro B, where he currently ranks 3rd in PER. He briefly flirted with the idea of enrolling in college (Gonzaga even brought him to the US for a visit) but decided against it eventually, preferring to spend his summer with the French junior national team, and even getting called to train with the senior team as a body for practice, where he reportedly held his own. Jaiteh stands around 6-9 or possibly 6-10 in shoes and sports an unbelievable frame that already looks NBA ready despite the center only having turned 18 years old six weeks ago. He has long arms and huge hands, and is fairly mobile for a player his size. He runs the court well and is extremely agile, showing very nimble feet that allow him to cover a lot of ground quickly in pick and roll situations on both ends of the floor. With that said, he's not much of a leaper, as he seemingly struggles to get very high off the ground for dunks, lobs and blocked shots opportunities. Where Jaiteh is at his best at the moment is as a rebounder, as he shows outstanding instincts pursuing loose balls with his long arms, quickness and soft hands, ranking highly in this category in Pro B on both a per-game and per-minute basis. He seemingly has even better potential in this area, as he's doing so without ever boxing out his opponent, getting all his rebounds purely on instincts and natural tools at the moment. Offensively, Jaiteh is fairly raw, as you might expect considering his age, not showing a very high skill-level and clearly lacking much in the ways of experience. He has the frame to establish great position inside the paint with his strong frame, but doesn't really know what to do once he catches the ball, as he sports poor footwork and lacks great balance, something he can likely improve on with added lower body strength. Nevertheless, Jaiteh will make some very interesting moves in the paint from time to time that hint at where his offensive game could be headed, as he shows terrific touch on his jump-hook shots and is able to convert plays with either hand, something you don't see very often from a big man his age. His soft touch lends itself to the mid-range area, where he can make an occasional jumper and knocks down nearly 70% of his free throw attempts. He still has a long ways to go to become consistent in this area, as he'll readily admit, but seems to have some potential away from the rim. Where Jaiteh will have to improve the most to successfully make the transition to the NBA is on the defensive end, where he shows very poor fundamentals at the moment. He's rarely in a stance here, giving up post position too easily to opposing big men who know how to take advantage of his lack of experience and physicality. On the perimeter, he has a difficult time moving his feet to stay in front of skilled big men who attack him off the dribble. Similarly, his off the ball defense is quite poor, and he rarely seems to know where to position himself to be in a spot to make a play, rotating haphazardly into the paint, or sometimes not at all. Jaiteh has the length to protect the paint much more adequately than he does at the moment, as he shows some nice instincts going after blocks at times, but it will likely take plenty of time and teaching to develop this part of his game. What's more concerning is the lack of intensity he displays, as he seemingly looks bored at times or like he's just going through the motions. He doesn't always sprint back on defense if he sees a chance to conserve energy, and won't run up the court to join his teammates on offense if there's any chance he might not have to. Part of this has to do with the setting Jaiteh is playing in, as many games in the second division seem to lack any real intensity level, while the coaching often leaves a lot to be desired. Players with his background have a reputation for being somewhat laid back, and the bad habits he may be developing right now are the reason some younger French prospects have shied away from playing at this level in the past. What's interesting is that Jaiteh gets great reports from everyone he's worked with regarding his character. By all accounts he's a very mature, composed, humble and well-liked by his teammates, which bodes well for his future. According to what Jaiteh and his agents have told us, and despite being the same age as most high school seniors in the US, he plans on entering his name in the 2013 Draft and would like to come over to the NBA as quickly as possible in his words. Because he turns 19 in the calendar year of the draft (November 27th) he is eligible to do so if he chooses. A handful of NBA teams have already been out to see him in France, and he is reportedly on the shortlist of potential candidates to be invited to the Nike Hoop Summit in April. Due to his extreme youth, and unique profile, there is obviously a bit of guess work involved in projecting a prospect of his nature. What he's showing in France thus far leaves a lot of room for optimism, though. Will he find a team that has the patience to develop him? And can they put a plan in place to work on his weaknesses, possibly in the D-League? Is that an intense enough setting for him? It will be interesting to see how much Jaiteh can improve his explosiveness in the future, as it seems like he should be able to play above the rim on both ends of the floor much more frequently than he currently does. Jaiteh suffered a stress fracture in his foot on December 23rd, which will keep him out for 4-6 weeks according to reports in France. One of the more physically gifted big men in attendance, especially considering he turned 16 just a few months ago, Mouhammadou Jaiteh (or Mam Jaiteh) is not a particularly skilled player, but regardless has considerable upside to continue to improve down the road. Standing 6-9, but already sporting a NBA caliber frame despite his young age, Jaiteh is a mobile center with good hands and solid athleticism. Offensively, Jaiteh is extremely limited, as he possesses very little footwork, average touch around the basket and is unable to pass out of double teams. Regardless of where he catches the ball on the floor, he's always looking to make a move, which renders him fairly turnover prone, particularly once opponents caught onto this fact. Jaiteh is nevertheless a massive presence inside the paint, allowing him to post some solid numbers at this tournament by crashing the offensive glass and simply presenting himself at the rim for easy finishes. Interestingly enough, he knocked down his free throws at a very nice clip (13/17) and even converted one decent-looking mid-range jumper. Defensively, Jaiteh can be effective due to his sheer length and bulk, and certainly got the job done on the glass, grabbing almost six rebounds in just 19 minutes per game. He lacks significant experience and fundamentals on this end as you can probably imagine, though, particularly in team defensive settings where he doesn't show a great feel for rotating and wasn't much of a shot-blocking threat despite his physical tools. It's way too early to be drawing any long-term conclusions about Jaiteh's potential, but it's safe to say that he'll be drawing some interesting down the road due to his terrific physical tools.